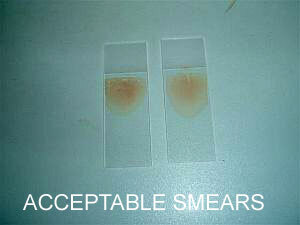 The role of the blood smear examination in any haematology report is often underestimated. Valuable erythrocyte and leukocyte morphological details may be missed if there is no freshly made blood smear submitted with a haematology request. Blood borne parasites, reactive lymphocytes and the presence of toxic neutrophils, for example, will require good morphological preservation for their identification. All cells start to deteriorate once removed from the blood stream (and their renewable sources of nutrients required for metabolism) whatever the anticoagulant and storage procedure. If samples are posted and delays occur vital information may be missed, and in certain inflammatory and neoplastic conditions cells will deteriorate even more rapidly. 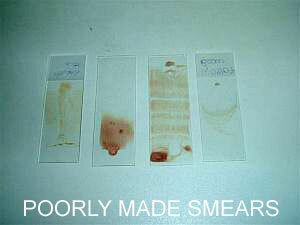 Even if your sample is to be processed on the same day via our courier service it is still important to submit that blood smear. Our analysers are highly efficient at recognising the individual cell types, but we still need to check results and add that individual comment which may produce that vital clue to the clinical problem. 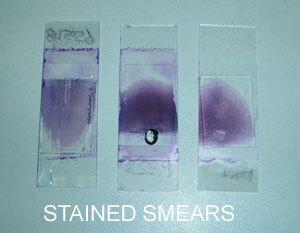 Click here for our information sheet on how to make a blood smear.